We continue to expand the trail system on our property in the Great Northwet, and that’s not a spelling error. 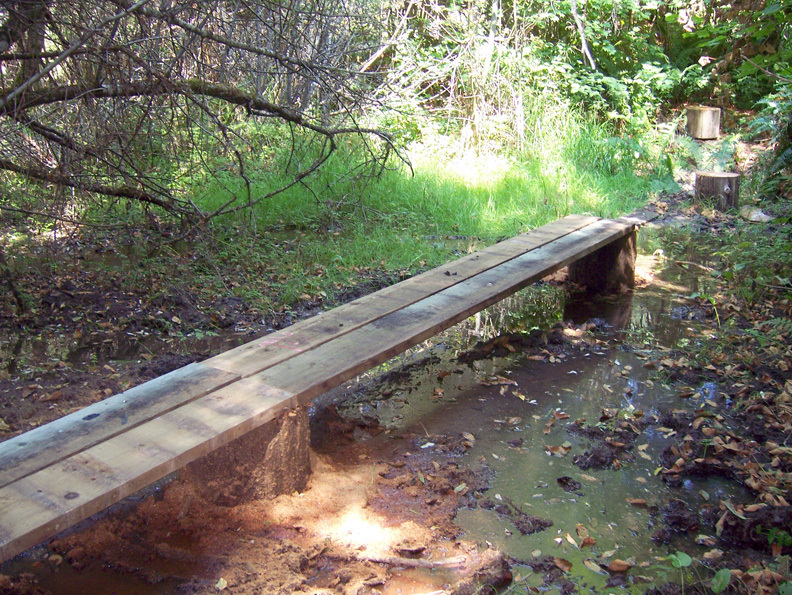 Here in western Oregon many areas that are passable in summer become higher-than-boots water in winter. One spot we have is a small wetland that is fed by a stream that runs year-round, just not as torrential during the dry months. 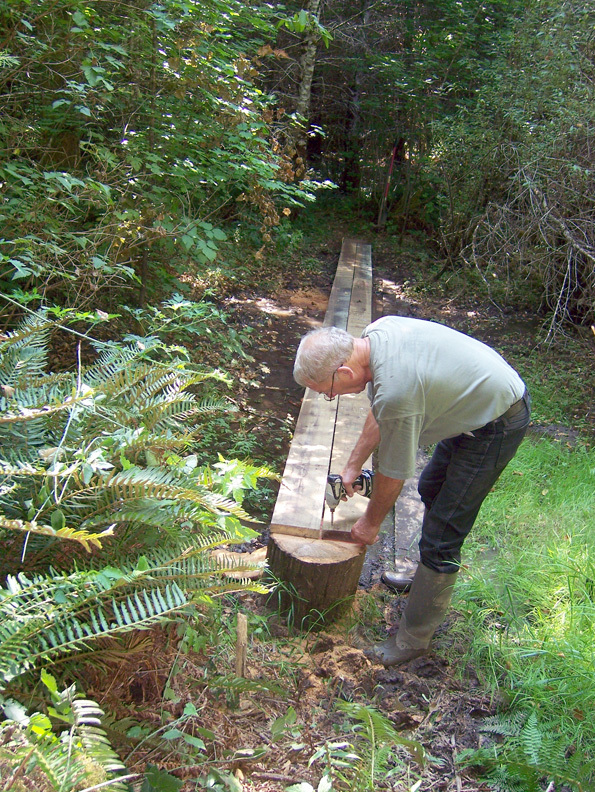 I decided it would be a good place to put a small stump-and-plank bridge so that we could connect two trails we like to use. I had some 20 inch diameter cedar posts that would work well for the bases. Planted in water and being cedar, they would not rot anytime soon. 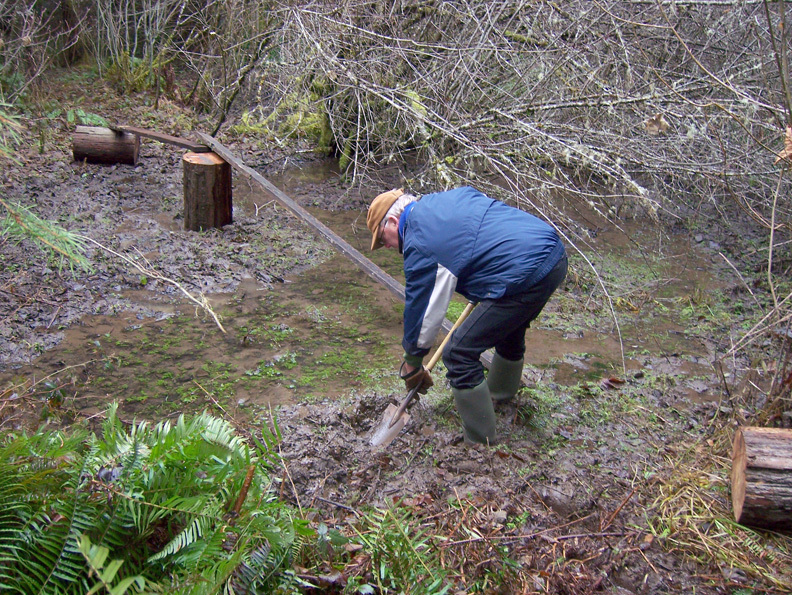 I cut them with a chain saw and then the fun part began – digging holes in deep mud, in water. Even in summer, it is a very boggy area. My goal was to dig until I hit more solid ground, but of course the sludge would just pour back into the hole as I shoveled. I dammed up in front of each hole as I dug to divert some of the water, and that helped. Mostly it just took persistence and a bit of mind over matter. I set the posts 10 feet apart for my 2×10 planks. If you use something smaller for planks, it is probably best to space the posts closer together. I cut the planks so that they centered on the posts and screwed them down. Then I used metal strapping to tie them together. I could add another deck using smaller dimension lumber to really beef it up, which I’ve done for other bridges on the property (more on them later! ), but after walking across this bridge every day for several months now, it seems to be all we need for such a short span – about 40 feet. I might punch some metal posts on each end and the center and add a rope railing for balance. In any case, it’s not a bridge for the non-sober! There were a total of eight holes to be dug for my small cable suspension bridge. They would house four posts and four dead-men (more on dead-men later). The posts were going to be three feet into the ground, but the plan also called for concrete punch pads, so that meant another ten or so inches of hole to dig. Why a punch pad? A two-foot wide pad of concrete would help to distribute the weight. 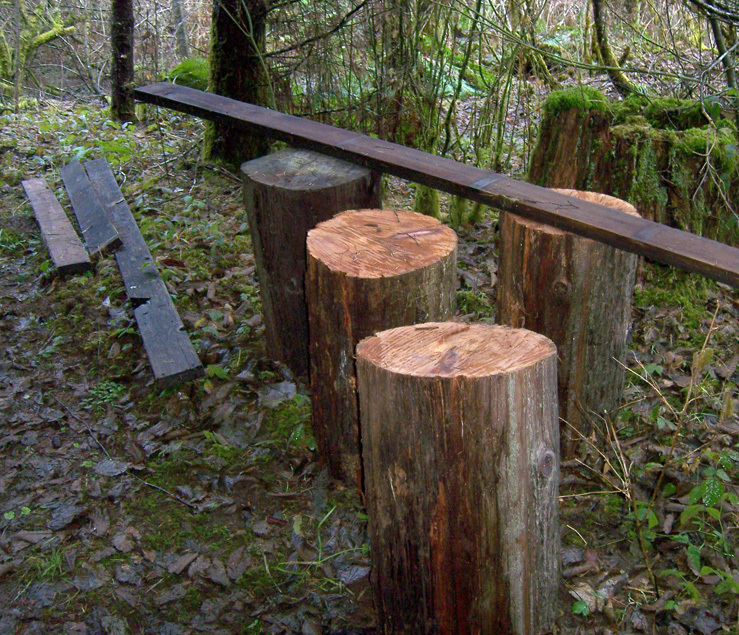 The posts were bearing much of the weight of the loads. If I just set the post to the ground, the point load might exceed the bearing capacity of the native soil. 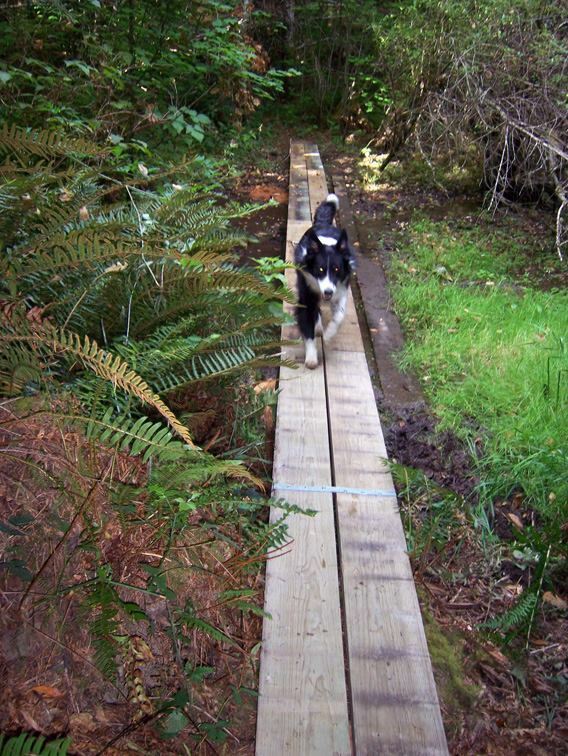 If there were a big load on the deck, such as a tree that fell on it, the posts could sink into the ground and cause the bridge deck to be lower over the creek. The point load would be far less than if I distributed the weight in a concrete pad. I figured 1,500 pounds of bearing load per square foot, so three square feet of concrete pad totaling twelve square feet would allow for a pretty hefty weight capacity. 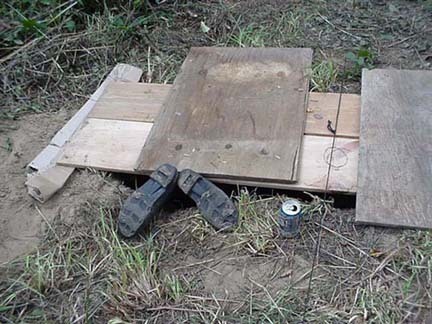 I also planned to make the pads about ten inches thick to give them more tensile strength in order to prevent cracking. Meanwhile, the plan also called for backfill with 3/4 minus gravel, which would be tamped at regular intervals. The gravel would help to protect the posts from insects and water damage, plus it would help hold the posts more firmly in the ground. 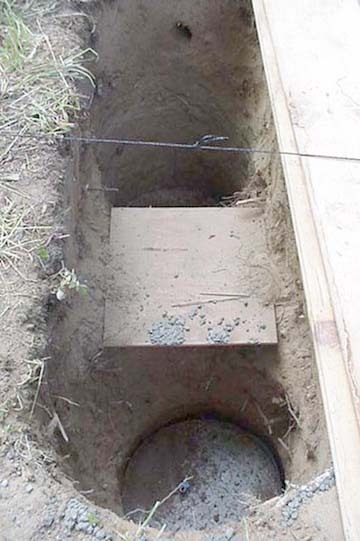 To allow for the backfill, the holes needed to be about two feet in diameter. I set to work and soon discovered that digging a hole that was only two feet wide was awkward to work in. After digging the first 18 inches or so, I connected the two post holes, creating an oval around both of them. It was easier to work in, plus, there would be that much more gravel backfill to add more security to the posts. I always use ready-mix concrete for small projects like these punch pads. The bags have the correct ratio of sand, gravel, and cement in them, so all one has to add is water and an energetic mixer. Some people don’t even bother to mix, but if you want a strong concrete base, you will want to mix it well. I needed to mix about three cubic feet of concrete for each punch pad, which amounted to six bags of 60 lb. ready mix per hole. Rebar and drift pins were already set into place. The pins stuck up about two inches from the center once the pads were poured. When the punch pads were cured, it was time to set the posts. I kept the holes covered until the posts and gravel were done. We didn’t need a critter or human falling in there.